Kate Middleton had two events related to Place2Be yesterday, November 22. The first was an embargoed event at the Natural History Museum where Kate and some kids wished Dippy the Diplodocus a farewell before he starts his tour of the UK. You can read about Kate at the Place2Be Awards here. The Natural History Museum announced last week that their Diplodocus skeleton cast, known as Dippy, will travel the UK from early 2018 to late 2020. Dippy will visit Scotland, Wales, Northern Ireland, and five regions across England: Dorset County Museum; Birmingham Museum and Art Gallery; Ulster Museum; Kelvingrove Art Gallery and Museum, Glasgow; Great North Museum: Hancock, Newcastle upon Tyne; National Assembly for Wales; Number One Riverside, Rochdale; Norwich Cathedral. The skeleton cast was presented to the Museum by industrialist Andrew Carnegie in May 1905, but didn’t make the move to the iconic Hintze Hall until 1979. The Diplodocus has since been the first sight to greet Museum visitors as they pass through the main entrance on Cromwell Road. 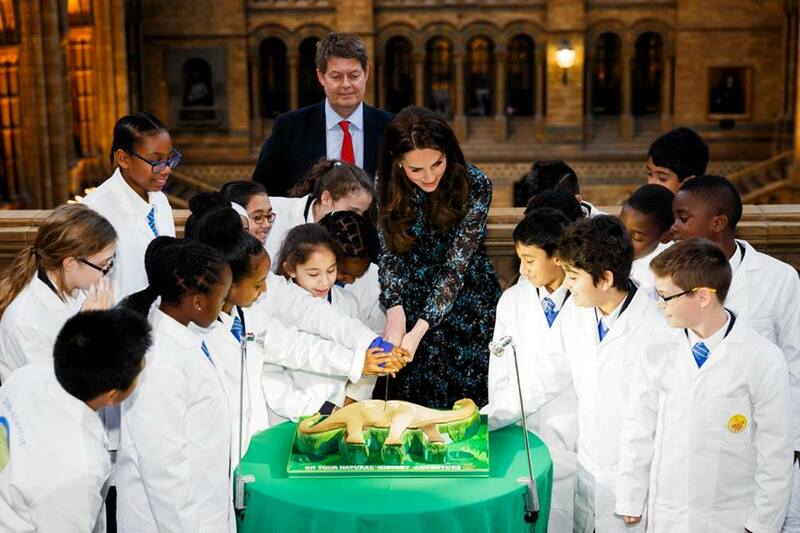 Kate, as Patron of Natural History Museum, attended a tea party with 20 children from Oakington Manor Primary School in London. The children were brought to the museum by Place2Be – another organization of which Kate is Patron. Kate joined the nine- to ten-year-olds as they enjoyed dinosaur-inspired craft activities and a mini fossil dig from the Museum’s Dino Scene Investigation activity for schools. Kate then cut a celebration cake for Dippy – whose last day in London will be January 4, 2017. Kate also asked the group of kids whether they had seen Jurassic Park and Jurassic World, and said that she watched it (I’m assuming Jurassic Park since Jurassic World opened in 2015) as a little girl and really enjoyed it. 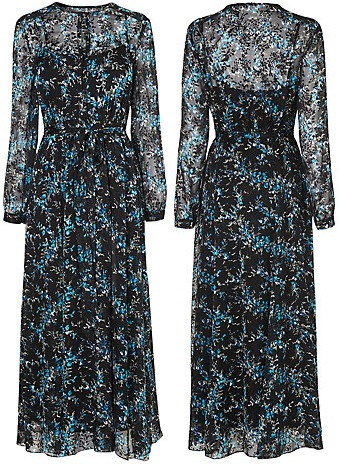 Kate wore a new dress, adding to her LK Bennett multi-color dress collection, this time the L.K. Bennett Cersei Dress (£375.00). Kate wore her hair down covering her Kiki McDonough Lauren Leaf earrings. Kate wore a new pair of gray heels which have not been identified yet, but they look cute and are something different from Kate so I hope she wears them again. UPDATE: Kate wore a new pair of heels from Hugo Boss, the “Staple P90-L” in “Anthracite”. Kate also had another bandage, this time on her left thumb. It would be incredibly difficult even for the most confident person to speak naturally and carry on meaningful conversation with children, adults, dogs, dinosaurs, whatever! with that many flashbulbs going off in your face like a nonstop strobe light. I thought she handled it very well, maybe starting to get used to all that?? The shoes are very cool, but the dress is school marmish. I just feel like she has so many great options-some that most of us wouldn’t remember seeing-that she should delve into the depths of her closet rather than buy new. I agree, she seemed more natural and comfortable. Agreed on the more natural… I liked that the kids helped her cut the cake! More warm and inclusive. Yes, more natural. Seemed to really like being with the children, Good for Kate. The dress was another boring one and she seems wedded to that style. Maybe, that makes shopping easier. Find something she likes and get it in dozens of prints and colors. Would have liked more color in the dark environment, though. However, all in all, a better appearance by the Duchess. She is heaps better. Like a different person almost. In terms of being natural and not massively self conscious, with all the flashes going off and media around it must be hard… and yet somehow Harry manages to speak to people and connect with them, Sophie (who wasn’t born into it) does too and Camilla too, Prince Charles, Princesses Ann, Prince Phillip… There are times when I feel sorry for Kate and do admit it must be difficult but this is 5years in, plus almost a decade of dating hoping for what is now her present reality, Mrs William Wales, HRH Princess William of Wales. How she didn’t prepare for that future is beyond me, I can’t feel sorry for her and let her off the hook for those two reasons. We’re 5years in after 8years of hoping. Meh another dowdy dress, buttoned all the way up. It’s too long and the sleeves are too long and the neck is too high. That and her heavy hair age her a lot. I like dinosaurs and I’m a female. Well she’s hard to hear but she is trying to engage the kids and is making an effort. She’s not a natural at doing this but points for trying. I loved dinosaurs when I was a kid, and still like them now. Although I never liked the T-Rex because Sharp Tooth. Ha ha! Yes, Sharp Tooth was scary. So was the T-Rex in Fantasia, which killed another dinosaur to the Rite of Spring music, and I’ve hated that music ever since. I loved dinosaurs when I was little, and my dad bought me a poster of a T-Rex chasing a smaller dinosaur and hung it on my bedroom door. For years I had a recurring nightmare that I was taking a shower and a T-Rex chomped away at the side of my house trying to get me, and I had to wrap myself in the shower curtain, grab my schnauzer, and run down the street screaming as it chased me. This was before Jurassic Park, which brought the nightmares back. Ah, sweet childhood. Triceratops all the way for me, although I love the Spinosaurus too. Oh how I hated Sharp Tooth as well! I think Kate really did seem more relaxed and appeared to enjoy being with the kids. I liked her shoes, the dress, not so much. She is trying. So, good for her. Hope all American commenters had a Happy Thanksgiving. It’s a special holiday and always very meaningful. I like the pattern and the neckline of this dress, but in my opinion the dress is too long. Not to mention that it just feels bad she had a new dress again after what William said about materialism. Why does she need to have new clothes all the time? She has a very similar dress worn when the Obamas visited. Kate has a 3rd dress that has a similar silhouette from LK Bennett. She was papped wearing it to dinner with Will. Such a waste… having all that money and buying the same thing over and over again. And also after all that talk about public funds being used to restore BP. She seems out of touch showing up with 400 pound dresses to every event she attends. The long dress with the long hair hanging down, it all makes her look heavy and pulled down. She needs a new hairstyle, quickly. This would have been a very appropriate time to wear trousers and a coat. Why does she always go so dressy-dressy? Sophie looked so great in her smart grey trousers and fab blue wrap coat last week. And it looks to be a black version of a similar dress she wore when meeting the Obamas. This is so wasteful. It’s not like the kids care what she is wearing. The bandages showing up again on her hands is a bit odd. Can someone who doesn’t do manual labour really be that clumsy and injure herself so much? The plasters are worrying. I’ve never known/seen anyone with plasters on their hands as frequently as Kate. At first i thought it was cooking accidents since we are told she cooks for the family and that’s a plausible explanation to my mind, but even amateur cooks don’t damage their hands as much as this, so it must be something else. Kate must have staff in the kitchen though? I do feel for Kate as I use bandages. Mind you I try not to use knives when I am half asleep. William could help Kate in the kitchen couldn’t he? If she is finally reading briefs/papers on the organizations and causes she is meant to champion, maybe they are papercuts? She’s had eczema on her hands since she was a child. I think that is why. Exactly! I only started following Kate for her fashion but I’ve been bored with her style for the past two years now. I would love to see her in trousers and a smart jacket especially when around children. It’s something most women would wear to the office. I think she does it on purpose to say “look at me, I’m a girly-girl and oh so pretty”. Sophie, Queen Letizia, etc are always on point with their sartorial choices. Kate hasn’t grown up. If she shows up in a nice pair of trousers and a coordinating (but not same as the pants) jacket with reasonable heels for an engagement I think this board will have a collective stroke. She’s actually taking some baby steps in the shoe department, so maybe she’ll venture into the world of trousers one day as well. If she prefers to wear skirts and dresses for public outings that is fine with me. I would love her to stop wearing things that look a bit like 70ies. I think the length is not flattering and the pattern remind me of old curtains. It makes her look outdated. But that is just my own opinion and I know a lot of people like this style. That said- she has already about ten dresses in that style and similar in colour. That is what really disappoints me with a lot of her new clothing right now. Exactly! With kids and dinosaurs, she could have worn a pantsuit at least, but I would be okay with her denim and high boots. Dress like an adventurer for this instead of a grandma’s garden party. I actually liked the whole outfit – the dress is more casual which is great for the venue, and the shoes are an appropriate height with a different style. Kudos. I would have preferred her hair in a pony tail, but all in all, not bad. I’ll bet that most of these clothes are given to her, honestly. Best marketing plan possible. Kate wears it, and the stuff sells out. No she is not allowed to accept them as gifts. As an aside I buy LKB clothes and have just had their Black Friday offers email. That dress is still very much available. Times are changing. The people who love this dress probably already have two very similar! Pretty much all I got from that. I thought it was a really nice event for her – she seemed to engage more with children than usual, and revealed something about herself (liking the movie) and not just her own children. I like that Kate initiated small talk with the children. However I don’t understand why Kate wears black around children. Why not a blue trousers suit or a green dress. I like dinosaurs as well, so does a cousins daughter who is five years old and used to wash hers daily. I also know through another cousin a woman scientist who is a specialist in dinosaurs. Jurassic Park is a film. I prefer facts about dinosaurs. It is good that we learn about George. I get the feeling George and Kate are close or they appear to be. Hopefully is is the first thought. Hair in a ponytail would have been good. This would’ve been a perfect time to wear trousers and a blazer/cardi. I think the dress too dark for her surroundings. I also take issue with only boys liking the T-Rex. She needs to stop those gender specific stereotypes. By the looks of it, she’s surrounded by young girls who love science and dinosaurs. I find it a bit insulting. Not only that but having nieces I don’t care if they play with lego or dolls. I don’t think it makes a difference. I think Carol started this stereotype. However I did read that being a more feminine girl attracts a guy. Which is what I take issue with when they are children. Charlotte needs to have a better role model in her life than Kate. if only she could hang out with Zara and her daughter more. They may have a privileged life, but it isn’t some Victorian housefrau mindset like Kate has. On a sidenote that blue cardigan worn for the recent Canada tour would have been ideal for this event. Charlotte has the double whammy of Kate and Carole to deal with. I’d love to see her spending time with Zara, Princess Anne, Mia, Autumn and the Phillips girls. Just to see her cut loose and running with them all. I think she did fine with the kids today. Maybe someone has advised her to ask question that are open ended instead of questions that just elicit a yes or no answer. She seemed more relaxed. Dress is frumpy as usual, but happy to see her eyebrow stencils are back on point as compared to the balcony appearance last week. That is the first time I could hear most of what she was saying in one of these videos! Cheers for speaking in an audible tone! Hip-hip-hooray! Did this event really merit another new flock? Not a fan of the ensemble but looks like she got her brows sorted out. They don’t look so wonky. Because girls can’t possibly like dinosaurs; science and history are masculine interests. Ugh. Enough with the gender stereotypes, Kate. She’s so overdressed again. This would be a perfect event for pants and flats or at least a low heel. I really wish she’d cut her hair. She’d look younger and brighter. But at least she held her own with all those cameras in her face. I wonder if Kate is injuring her thumbs from knitting scarfs for Christmas presents. If the needles are held wrong….your fingers can get sore. I like seeing the video of Kate talking to the kids. As others have said it must be very difficult to be natural with a camera that close to your face. But I liked hearing her tell the kids that Dippy was going to go to Scotland. Right in that moment I felt like I saw a little more personality from her. I really wish Kate could be like this more. I want to see Kate’s personality. Even though she has been married five and a half years and I have been royal watching a while, I still don’t really feel like we get to see Kate’s personality. I feel like I know more about other royal women from casual interviews they have given. I have seen good interviews with Princess Mary, Princess Mette-Marit, etc. It would be really great if Kate could do a sit down interview like Eugenie recently did where Kate talks about why Place2Be is important to her. The last time she tried giving an interview it was so scripted (the Queen at 90 documentary). I feel that too often, Kate is more preoccupied with making sure to look perfect for pictures than she is with being natural and being herself. Even the Queen has participated in documentaries where she talks casually. Like there was one about her sitting for a portrait and you can see how she chit chats with the painter. I know Kate probably would prefer to never speak at all and just pose for pictures because I think that is how she defines her role, but I wish she would give an interview about her work with mental health. Someone must have threatened to cut her clothing budget if she didn’t up her performance, lol. So now we see that Kate is capable of putting in a decent performance at her job and also to improve. Now she needs to do it more consistently. I’ll reserve my positive praise until then.